Headstones Vandalized at Philadelphia Jewish Cemetery - I Think, Therefore I Rant! I Think, Therefore I Rant! This is absolutely terrible. The perpetrators need to be in prison. There is simply too much hate in the US right now. This is especially cruel to the families of those that are laid to rest. 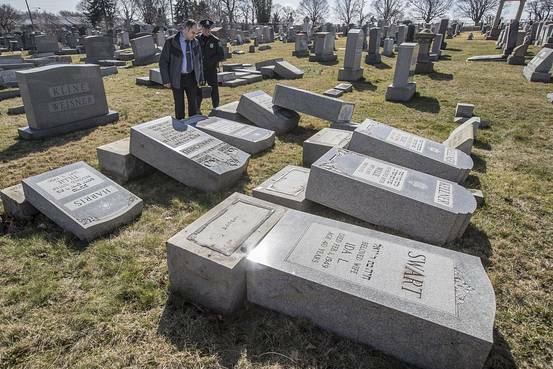 More than 100 headstones at a Jewish cemetery were vandalized in Philadelphia over the weekend, adding to a recent wave of anti-Semitic acts across the nation. Police arrived at Mount Carmel Cemetery in the Wissinoming section of the city on Sunday morning to find someone saying three of their relatives’ headstones were damaged, according to the Philadelphia police department. The officers inspected and found dozens of additional headstones knocked over. Police said the incident occurred on Saturday night, and they are investigating the crime. The incident comes after as many as 200 headstones were toppled earlier this month at a Jewish cemetery in Missouri. Bomb threats have also been made against Jewish community centers this month, according to the JCC Association of North America, an umbrella organization for local Jewish community centers around the U.S. Previous PostA speech to denounce Meryl Streep and her one-sided statementsNext PostHow do you spell whiskey? Why should a teenager in America be afraid of a Congresswoman? Cool video to help save the coral!! How do you spell whiskey?